The Cinder Mine is a room inside the Secret Mine in Luigi's Mansion: Dark Moon. The Cinder Mine is accessed by taking the northwest door inside the Deep Hall. The Cinder Mine is a small room with many pipes running through the area. The pipes contain a substance that ignites when exposed to air. A part of the room blocked by ice has bags of coal inside them. The door on the south leads back into the Deep Hall. During D-2: Hit Rock Bottom, Luigi needs to go to the Cinder Mine to get a key for the Crystal Quarry. When Luigi enters the room, he must turn the valve so the pipe leaks a substance and ignites it. After that, Luigi must take a log from up north and ignite it so he can melt the ice obstruction on the left side. 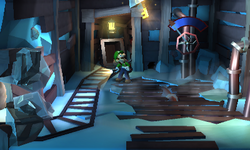 Once the coal bags are investigated, Luigi can ignite a piece of coal and shoot it into the icicle containing the key. If Luigi looks through the hole in the Deep Hall into this room, he can see a Gold Greenie taunting him. This page was last edited on May 1, 2017, at 21:34.